The lead cover feature of Performance Racing Magazine’s June 2015 issue is on land speed racing. The magazine asked me to examine the sport from a business perspective, an angle I haven’t covered in many years but enjoyed developing immensely. You will see some very familiar names, some brand new and an unvarnished statement of serious concern from Turbocharger Wizard Kenny Duttweiler that caps the piece. 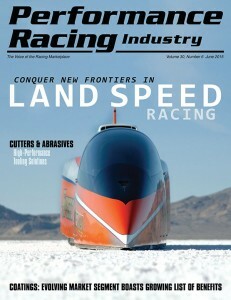 While the profit margins are rather low for high performance vendors selling the the Land Speed Racing crowd, there is a magical allure that seems to outweigh the bottom line. No surprise to those who already play on the salt . . .
And yes, the cover photo is mine and it is the same image used on my recent book, “Demon’s Dozen” recounting the astonishing 2012 speed deeds of George Poteet and the Speed Demon Racing Team where in they exceeded 400MPH a dozen times simultaneously setting multiple world and national speed records that still stand today.